In Buddhism we have an incredible arrangement, universal education from the beginning at birth up until death, as an old man. I feel these things could be put into a universal language. Give up religion, give up Buddhism. Go beyond Buddhism. Put the essential aspect of the philosophy into scientific language. This is my aim. Universal Education for Compassion and Wisdom is one of FPMT’s Five Pillars of Service. The UECW pillar sits with the other four Pillars of Service – Dharma, Social or Community service, Interfaith activities and Revenue-generating activities. The Foundation for Developing Compassion and Wisdom (FDCW) was established in 2005 to help create a more peaceful, compassionate and sustainable world. FDCW provides excellent quality educational programs and training that help transform minds and make people happier. These programs are based on Universal Education for Compassion and Wisdom (UECW) which is a system of inner learning allowing people to break through their self-limiting beliefs, step outside their destructive patterns, build better relationships, and ultimately develop their own innate capacity to be wise and compassionate. 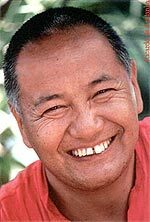 The creation of UECW was inspired by Lama Yeshe’s vision for “a new kind of education for the world”, first developed in the early 1980s. His Holiness the Dalai Lama, the Honorary Patron of FDCW, is one of the world’s leading advocates for the promotion of positive human values and secular ethics in education. FDCW’s programs directly impact people in the sectors of education, healthcare, corporate, homelessness, and hospices. Our Annual Review demonstrates this in more detail with Case Studies across these sectors. We have a faculty of accredited facilitators around the world, bringing the programs into their particular field of interest and expertise. There is a rigorous training pathway to ensure the programs are delivered in a consistent manner that preserves the integrity of the programs. There are accredited facilitators throughout Australia, Asia, Europe, North and South America. The faculty is expanding each year due to the strength of the programs and local demand. The particular strength of our 16 Guidelines program is that it is universal and its techniques can easily be adapted to fit the needs of a range of different audiences. For example, the 16 Guidelines program has been introduced successfully to school teachers at Maitreya School in Bodhgaya, India. The University of Toronto, Canada, has been partnering with our 16 Guidelines program for many years, as an integral part of its certified applied mindfulness programs. This program is very popular with students and is growing. This is our newest program, and explores three interconnected themes: Inner Happiness; Good Heart; Clear Mind. FPMT centers, projects and services: please contact us for more information about offering one of our programs. Visit our global calendar of UECW events. FDCW-recognized programs offer people of all ages and cultures the opportunity to develop: mindfulness and self-awareness; emotional intelligence and resilience; empathy, kindness and social responsibility; harmonious and caring relationships; and a greater sense of well-being and purpose.